Some of you may have seen or even enjoyed playing Bally’s Michael Jackson King of Pop video slot at your favorite land-based casino. For those of you who haven’t had the chance yet as of May 25th, you now have the opportunity to play from the comfort of your own home or even on the go from your favorite mobile device because WMS is adding this new slot game to your online gaming lineup. The new Michael Jackson King of Pop slot game is a five reel twenty-five pay-line video slot that is packed with bonuses as well video and audio clips of the King of Pop’s most famous songs including Bad, Smooth Criminal, Billie Jean, Beat It, and more. 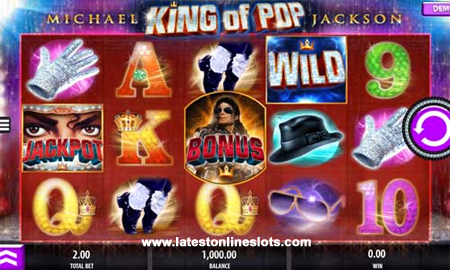 While this new slot game is loaded with bonus features, I would have to say the most exciting feature about Michael Jackson King of Pop slot is its external Progressive Jackpot worth forty million times your bet. This jackpot is triggered while playing max bet when five scatter symbols appear across the reels. A few the other bonus features you will find in this new slot game are the “Smooth Criminal” free spins feature. During the “Smooth Criminal” bonus round, Michael Jackson will dance across the reels causing stacked wild symbols to move from right to left. Another free games bonus you will find in this new slot game is the “Beat It” feature in which Michael Jackson will dance out of a video freezing wilds and locking them into place. These wilds will remain locked in place until the free games end. So if you fancy yourself a smooth criminal it looks like your game has arrived! You can find it at your favorite online casinos that offer WMS slot games such as Mr.Green.